Miguel Berchelt, the 33-1 Mexican superfeatherweight titlist faced the 41-5-1 Argentine Jonathan Victor Barros for the WBC World Superfeatherweight title in Berchelt’s home country of Mexico on Saturday evening. The bout, which was carried live on various ESPN+ streaming services, was a high octane affair. With the Mexican crowd cheering him on, Berchelt engaged in an active first round, then actually dropped his man with a left hook at the very end of the second. Barros got to his feet, but, as ringside analyst Teddy Atlas claimed, the champion was “just bigger and younger.” Sure enough, Barros went down a second time in round three. Barros subsequently tried to run, but the man was dropped yet again later in the round. The challenger’s corner stepped in and ended things at that point, much to Barros’ dismay. It was the third defense of Berchelt’s belt. 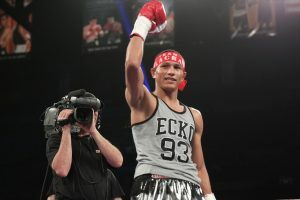 The brief affair was a story of Berchelt simply tossing far, far too many punches Barros’ way, which didn’t allow Barros to react in any effective manner. From the opening second of round one, Berchelt was determined to impress his countrymen in the audience. He was all forward motion and violence throughout the proceedings. In short, he made quick work of his overmatched opponent.